Having just completed their tenth vintage under the Greywacke name, husband and wife team Kevin and Kimberley Judd are perhaps unsurprisingly reflective on the decade preceding them, particularly when the last two have been some of the most challenging in recent memory for New Zealand. “Hottest January on record” Kimberley adds. We’re discussing the 2018 vintage by way of tasting, and ruminating on that of 2017, the most recent release of Greywacke’s Sauvignon Blanc, and the fact that they’d now dealt with a “couple of tricky vintages in a row”. 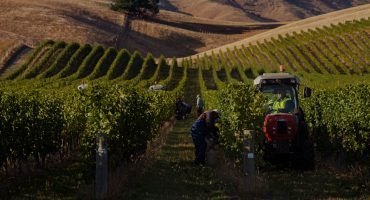 Everything was going fine for the 2017 vintage, despite unexpected rainfall in November, until two cyclonic fronts made their way across the South Island of New Zealand, necessitating an urgent harvest. The difficult vintage has consequently seen some variation in the response from wine critics to the 2017 Greywacke Sauvignon Blanc. Scores of 16.5 (/20) from Jancis Robinson, 91 (/100) from New Zealand wine expert Rebecca Gibb MW in Decanter and 95 (/100) from Bob Campbell MW have shown that wine criticism is highly subjective, never mind Maryann Worobiec in the Wine Spectator scoring it 87 points (/100), a little unusual given some of the other scores dished out for this year’s releases. Is climate change affecting Marlborough’s wine? The Coldest. The Wettest. The Hottest. The Driest. “Then’93 was the absolute coldest on record, [and] still is. That was Mt. Pinatubo (the volcano in the Philippines that erupted in 1991, causing global temperatures to drop by 0.5 degrees Celsius for the following two years, such was the concentration of particulate in the atmosphere). ’95 is still the wettest on record. ’98 was the hottest on record and ’01 was the driest on record so within 11 years we had a lot of strain." That cyclonic weather is having that much more influence on the region is a concern for the future. Coming from the North, the rain falls warmer, making the dreaded Botrytis more likely to hit. Kevin romanticises “I love the sound of the rain on the roof. But not during harvest”, before remembering that we’d been discussing his Sauvignon Blanc. 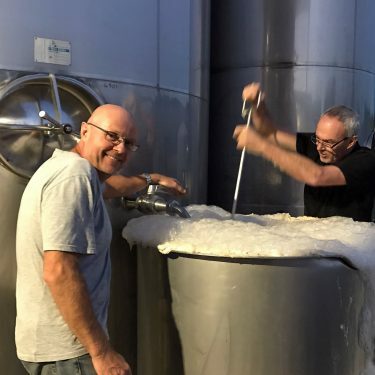 “Yeah I think the Wine Spectator were a bit hard with us on that one but you’ve got to take the good with the bad…"
Kevin and brother Steve getting a Sauvignon Blanc fermentation going. What about the talk of winemakers needing to look for alternatives to Sauvignon Blanc? Kevin isn’t so sure. “David Hohnen (Kevin’s former employer and founder of Cloudy Bay) was worried that it would go out of fashion back in 1990.” Tasting the 2015 vintage of Kevin’s Wild Sauvignon, a wine we’ve been huge fans of for quite some time, you might question whether the truest expression of Marlborough Sauvignon Blanc has yet been settled on. This is deeply textural, even compared with the house style, but against the slew of higher yielding, less concentrated examples that have flooded the market, it’s a pleasant surprise to taste the grape in this, dare I say, more serious form. Were it not for the vibrancy of the ripe fruit, this could almost be mistaken for top level Bordeaux Blanc. This complexity should come as no surprise given that the wine has fermented for almost a year, speeding up and slowing down with the seasons as the ‘wild’, fragile yeast goes about its job. “There are certainly people mucking around with other varieties, Gruner Veltliner, little bit of Syrah. I’d be tempted to do a bit of Syrah one day”, Kevin moots. Kimberley adds “The problem with Marlborough is, well, anywhere probably, that we’ve got such big companies coming in and they’re still planting huge tracks of it [Sauvignon Blanc], and you think ‘where on earth is it all going?”It must be hard to find anywhere to plant new varieties with this going on, never mind the risk of more experimental wines becoming swamped by the extra output of the area’s star turn. Something that saves producers like Greywacke in these erratic weather conditions is their propensity to crop lower so that they can ripen and therefore pick earlier. 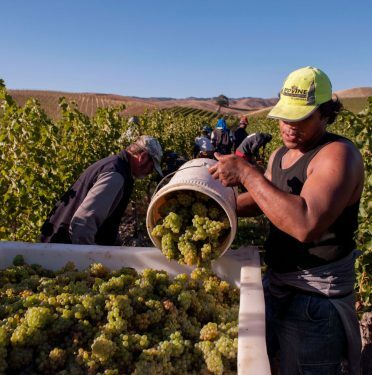 Having already restricted the crop, standard procedure for fine wine producers looking to concentrate growth into less, but higher quality fruit, Kevin and his team were able to harvest ripe fruit before the worst of the rain. For Kevin, making wine is “more about the vineyard sites. Keep the crop down [and] get it as ripe as possible.” Larger, more “corporate” producers need to bring in the biggest crop they can to make as much wine as they can, which inevitably comes at the cost of quality, albeit giving supermarkets something to shift by the pallet at £7 or £8 a bottle. “We’re signed up. It’s a concern that there’s no regulations over stuff that’s bottled overseas (much of Marlborough’s bulk wine production is shipped to the EU in ‘bladders’ before being bottled, reducing shipping costs). It’s a concern to see all the greedy bastards jumping on the bandwagon, doing a really poor job of viticulture. It gives the brand a bad name. We move onto the 2015 Greywacke Riesling, made in an off-dry style. Half of the wine is fermented in old barrels with natural, wild yeasts, the other half in stainless steel. As in their Chardonnay, the wild yeast appears to add a little smoke, which in turn seems to be melding with Riesling’s inclination to develop petrol notes with age. Despite only being three years old, this is already coming on nicely. “How much did we make this year Kevin, a bit more [than last year]?” Kimberley asks, provokingly. 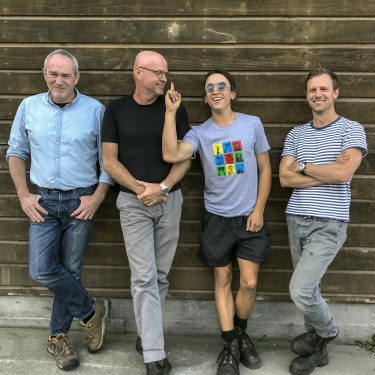 The Greywacke 2018 vintage crew, L-R: Kevin, his brother Steve, nephew Harry and winemaker Rich Ellis. Despite Kevin suggesting that the team wait a couple of days and wait for pickers, Kimberley and Co press on, picking one tonne of fruit in a day, leaving five tonnes of fruit, hopefully to be picked later. A wonderfully expressive Pinot Gris which is gently off-dry in style. A delicious fusion of deep and ripe summer fruits.